Cross-country and multi-use trails can add value to real estate—and we can prove it. The report (Economic Impacts of MVSTA Trail and Land Resources in the Methow Valley, Resource Dimensions, 2005) confirms that cross-country ski trails—and even more so, well-designed and built multi-season trails—can induce people to move to a specific location to live near those trails. And pay more for the privilege. It’s no secret that convenient access to recreation and viewsheds increases land value. This applies to trails and greenways, too. (Perhaps the best summary is Economic Impacts of Protecting Rivers, Trails and Greenway Corridors, National Park Service, 1995). But the Methow study concentrates for the first time on a trail system whose dominant use is cross-country skiing, and it quantifies the economic consequences. The Trapp Family Lodge in Stowe, Vt., was the first and probably most celebrated Nordic ski destination in North America to explore this potential. According to general manager Hans von Wees, Trapp’s introduced timeshares in the early 1980s, adding ski-in/ski-out “middle-high-end” villas in 2003. About half of their buyers are Baby Boomers, while most of the rest are Gen Xers in their 40s with families. Von Wees notes that while cross-country is “very important” to sales, that’s just part of a multi-use trails experience that also includes hiking and running. There are also cases where cross-country areas have unintentionally spurred real estate sales. Montana’s Lone Mountain Ranch is one of the half-dozen most famous Nordic destinations in the U.S. Marketing manager Nancy Cooke says that, inspired by their ranch experience, “well over a hundred” guests—many, but not all, cross-country skiers—have bought property in Montana. The ranch itself has become a real estate play; it was purchased in July 2007 by Everlands as part of a world-wide network of fractional ownership destinations. Currently you can buy in for $1 million, with annual dues of $40,000. Historically, a lot of alpine managers have had problems treating cross-country as anything more than a gesture—even though a number of alpine affiliates see more than 25,000 Nordic skier visits annually. In addition, Leisure Trends Group says that 22.4 percent of U.S. alpine skiers have also cross-country skied in the past two seasons. Are Boomers finally making the switch, as has been predicted for decades? A new generation of four-season resorts may change a few minds. Tamarack Resort in Donnelly, Id., has sold its high-end property extremely well. The resort targets multi-generational travelers, many of whom enjoy the resort’s vast network of multi-season trails. Communications manager Jessica Flynn notes that “Tamarack’s master plan was designed with a trail system fully integrated throughout all of the residential communities, providing trail access steps from the porches and front doors of many of the homes. The ease of accessibility throughout the resort, and the proximity of recreation, is a significant selling point to potential buyers.” From the beginning, Tamarack incorporated Nordic into the plan; cross-country was the first full recreational offering opened at the resort. Moonlight Basin in Big Sky, Mont., is another high-end real estate-driven resort. According to trails and landscaping manager Simon Trautman, cross country will be part of a multi-season/multi-use network, with the Nordic operations nexus at a trails/community/recreation center. 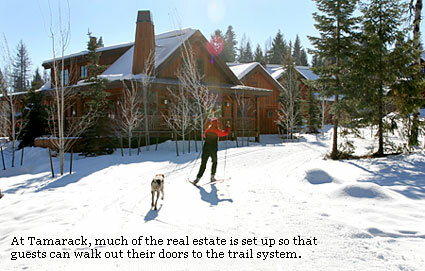 How do the people who sell high-end recreational properties in resort regions feel about trails? Anne Eckman is a broker/owner/broker at Silver Star Associates in the Methow Valley. She’s seen a lot of Baby Boomers who came to Nordic ski, got to know and love the community, and decided to retire in the Methow. Eckman says that prices have risen so much that a lot of residents have moved out of the prime real estate in the upper valley. Prices are still rising and sales are steady, but inventory is way down, from 800 listings in 1999 to 250 listings in August 2007. Beaupre believes that most people don’t buy for Nordic skiing alone, but for proximity to multi-season trails. She notes that “lots of Boomers are dropping into an active lifestyle,” and her women friends in particular love the accessibility of cross-country as an alternative to downhill. Beaupre notes that Marabou, an extremely successful development near Steamboat, where five-acre lots sell for $2 million to $5 million, has “amenities at your fingertips” including a groomed cross-country trail network. There’s another intriguing prospect in the real estate/Nordic relationship: Resorts where property sales will be driven primarily by cross-country skiing. Royal Gorge Cross Country Ski Resort in Soda Springs, Calif., was purchased in 2005 with the intent of creating a “conservation community” that’s centered on recreation. Project manager Mike Livak explains that all of the proposed 950 units on 3,000 deeded acres will be Nordic ski-in/ski-out. Cross-country is “absolutely crucial” to the project; trails will be designed for multi-season use; and target markets are like-minded people who love the outdoors and recreation and want a home in a natural environment. The Nordic ski market has changed dramatically since the sport burst on the scene in the 1970s. These days it appeals to the affluent, especially to women; and these trails can help sell premium-priced property at resorts. This is a trend that has legs.